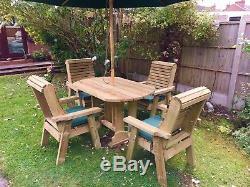 Ergonomic Garden Table, Bench and Chair Set. Comprising of 1 table and 4 chairs. Fixed with 10mm bolts and screws. Total footprint 190cm x 340cm. 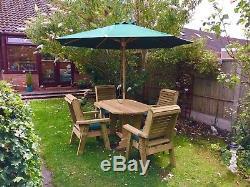 (Parasol and cushions not included). 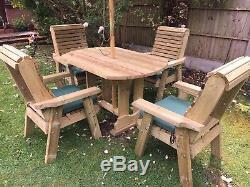 This set comes delivered on two wooden pallets. The benches and chairs are fully assembled and the table is part assembled. We use the finest Scandinavian Redwood which is a slow grown timber with a decorative grain and is ideal for out door use due to the fact that it has also been pressure treated. You do not have to worry about painting these chairs as the treatment that they have had protects them against rot and decay. Left untreated the wood will turn an attractive silvery grey over time, however, if you want to add a colour or stain then that is fine as the wood will take pretty much any product. Our furniture is solid and substantial and we Do not use nail guns, every piece has been pilot drilled then screwed together. We are a family business operating in the pituresque Churnet Valley, in the heart of the Staffordshire Moorlands, we have a small work shop where we produce high quality wooden furniture of all kinds. Our furniture is eco-friendly because we only use timber from Scandinavian forests that are protected by the Forestry Stewardship Council (FSC) Where trees are cut down responsibly and many more are replanted in their place. Also the fact that we go to the extra effort of having our timber pressure treated means that it is protected against the elements for up to 25 years. A lot of the garden furniture on the market nowadays is made to last for as little as three or four years, therefore, our products will last nearly four times as long, putting less of a strain on this beautiful planet's natural resources. They may require some part assembly by yourself. Smaller items will be sent by parcel post. LE, AL, B, BB, BD, BL, BS1-29, CB, CF, CH1-8 CH9-99, CM, CO, CV, CW, DA1, DA2-18, DE, DN, EN1-9+, FY, GL, HD, HG, HR, HP, HU, HX, IG, IP, L, LN1-7+, LS, LU, M, MK, NE1-60, NE98-99, NG, NN, NP, NR, OL, OX, PE1-3+, PO1-29, PR, RG 1,2,7-9, RG4-6, RG12-49, RM, S, SG, SK, SL, SN 1-5, 7-16, 25-26, 38, SO1-23, SO30-32, SO50+, SP, SR, SY1-9, TA1-13, TA19, TA21, TS1-5, TS19+, TF, WA, WD, WF, WN, WR, WS, WV, YO. These products are very heavy so please take care when lifting and if you feel like the items are too heavy to carry by yourself then please ensure that you get someone to help. We cannot be held responsible for any injuries, or damage to property, caused through carelessness. The fact that we go to the extra effort of having our timber pressure treated means that it is protected against the elements for up to 25 years. All of our products are handmade. They are made from wood which is a natural product, so there may be slight imperfections like cracks or splits in the wood that may occur with changes in the weather it is due to the wood losing moisture during warm and dry seasons and exposure to intense sunlight. During colder and wetter seasons the wood will uptake moisture again which will reduce these splits or cracks. This is of no detriment to the product. We try our best to get rid of splinters and rough edges but we may not eliminate all of them. 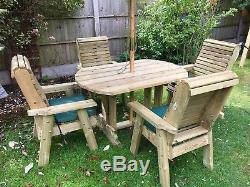 The item "Wooden Table And Chairs Garden Patio Set Wooden Garden Furniture Solid (ERG46)" is in sale since Saturday, July 22, 2017.